Susan Dolan didn’t anticipate that her move from England to the United States and education at University of Oregon would result in managing a key program for the National Park Service: the Park Cultural Landscapes Program, headquartered in Washington, D.C.
For Dolan, preserving a cultural landscape isn’t just a job description. It’s like having a window into history. 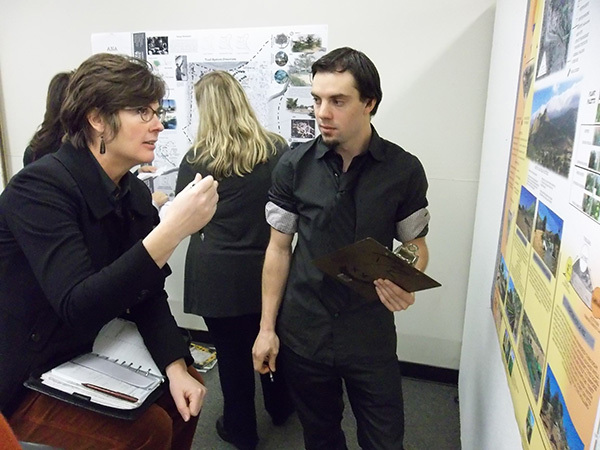 Above: Susan Dolan reviews work by David Richards, a fourth-year architecture undergraduate student, in the final review of a fall 2013 studio taught by Professor Robert Melnick that focused on Cesar Chavez National Monument. Dolan, BLA ’94, MLA ’96, now serves as manager of the Park Cultural Landscapes Program of the National Park Service in Washington, D.C.
Dolan’s work includes adapting landscapes to accommodate climate change, fostering traditional cultures within historical landscapes, and increasing sustainability efforts by the Park Service. “Our direction is moving toward building greater resiliency in the cultural landscapes we preserve by using more sustainable practices, focusing more on the health of ecosystems that are entwined with these cultural imprints on the land, and trying to increase their capacity to be more resilient to withstand the changing climate,” she said about the Park Cultural Landscapes Program. When Dolan came to UO in 1991, she had a bachelor’s degree in horticulture from the University of Reading in England. She was looking to bridge the gap between her interests in horticulture therapy and landscape architectural design for people with disabilities. Professors such as Rob Ribe, Kenneth Helphand, and Melnick taught courses about site analysis, history of landscape architecture, cultural landscape preservation, and the history of the national parks, which led Dolan to her newfound inclination. Melnick introduced Dolan to an acquaintance with the NPS, which gave her the opportunity for an internship through the National Council for Preservation Education in 1995 in Washington, D.C. She graduated from University of Oregon in 1994 with a bachelor’s degree in landscape architecture and in 1996 with a master’s degree in the field. She continued work as a consultant after graduating, and was hired for her first career position with NPS in 1997. Dolan worked two jobs for NPS, serving both as a historical landscape architect for the Regional Cultural Landscapes Program for the Pacific West Regional Office in Seattle and as landscape architect at Mount Rainier National Park. The 2.5-hour commute between the two locations compelled Dolan to alternate her schedule, spending every other week at each office, working for two bosses in two duty stations, and living out of two homes. She also traveled around the country as the nation’s preeminent consultant on historic orchards. She held her position at Mount Rainier National Park for ten years before shifting to her current management post in June 2011. To this day, Mount Rainier remains her favorite national park. Dolan expresses gratitude to Melnick, since his work with cultural landscapes preservation launched her career. She recently helped him review a grant proposal dealing with cultural landscape climate change. Former professors regularly ask her to return to guest lecture about landscape preservation. Over time, their relationship has changed from professor and student to colleagues. Today, Dolan works as a historical landscape architect for the NPS and as manager of the Park Cultural Landscapes Program, where she advocates for the cultural landscapes of the 401 national parks. Her numerous publications include Fruitful Legacy, a 251-page book that details the historic context of orchards in the United States and provides information for their preservation. Dolan’s management oversees seven regional offices nationwide. A principal task of her job is to set goals and provide direction on a landscape’s adaptation and response to climate change. This includes implementing a three-fold practice of environmental, social, and economic durability. One example of the greater cultural resiliency practiced by Dolan’s program is the Hubbell Trading Post National Historic Site, the oldest Navajo Trading Post in the country, located near Ganado, Arizona. Thousands of years before the park was created, the Navajo people used this land to grow and sell traditional crops and livestock. The Navajo created their own yarn and dyes for rugs, crafted pots, clothes, jewelry, and other trade goods. Hubbell Trading Post was established as a historic site in 1965. Since then, the management focus was primarily on the site’s artifacts for museum collection. Consequently, the agricultural landscape became fallow and infertile. A collaborative effort among a private consultant, NPS staff, and Cultural Landscapes Program staff helped develop an agricultural leasing plan, which enabled the Navajo people to lease the farmland. While the Navajo do not currently live in the park, many live in Ganado and some are employed by NPS in the park. Navajo have returned to Hubbell Trading Post to restore the traditional field pattern and crop rotation, resulting in a landscape becoming more authentic in character, with traditional cultural practices returned. Dolan says the support of sustainable traditional agricultural growth will build environmental durability; perpetuation of traditional agricultural knowledge builds social durability, and the tribe’s financial benefit from their harvest creates economic durability.